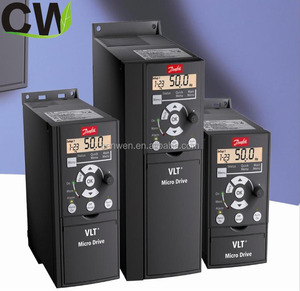 Cen Wen (Shanghai) Technology Development Co., Ltd.
0.25 kW - 45 kW 380-480 V . 0.37 kW -1000kW 525-600 V . 0.75 kW - 90 kW 525-690 V .
micro inverter danfoss vlt drives vlt automation drive FC360 micro inverter danfoss vlt drives vlt automation drive FC360 Product name danfoss inverter Warranty 18 Months wanrranty 18 months order number 134F2982 input current 380-480v motor power 15kw Related Products Packaging & Shipping Contact us 1. How is your product9 We guarantee a new authentic 2. How long will your goods arrive9 In addition to the spot, the other goods are generally 4-6 weeks 3. What time do you ship9 Our company provides payment to delivery 4. What payment method do you support9 Bank card . Please consult if there are special circumstances . This makes installation and commissioning easy and safe for refrigeration technicians and installers. 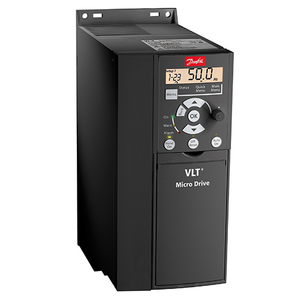 The continuous variable speed control provided by the VLT Refrigeration Drive makes intelligent capacity control possible. Efficient EMC mitigation also enables the use of cables with small cross sections which reduces installation costs. 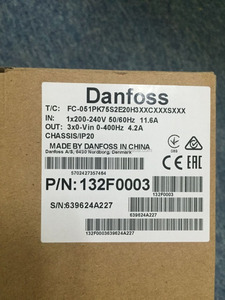 132F0018 Danfoss Micro Drive/ FC-051 series 0.75kw inverter with high frequency&good quality&competitive pric e FC101 Model Order number Power(KW) Current(A) FC-101PK37T4E20H4XC 131L9861 0.37KW 1.2A FC-101PK75T4E20H4XC 131L9862 0.75KW 2.2A FC-101P1K5T4E20H4XC 131L9863 1.5KW 3.7A FC-101P2K2T4E20H4XC 131L9864 2.2KW 5.3A FC-101P3K0T4E20H4XC 131L9865 3.0KW 7.2A FC-101P4K0T4E20H4XC 131L9866 4.0KW 9.1A FC-101P5K5T4E20H4XC 131L9867 5.5KW 12A FC-101P7K5T4E20H4XC 131L9868 7.5KW 15.5A FC-101P11KT4E20H4XC 131L9869 11KW 23A FC-101P15KT4E20H4XC 131L9870 15KW 31A FC-101P18KT4E20H4XC 131L9871 18KW 37A FC-101P22KT4E20H4XC 131L9872 22KW 42.5A FC-101P30KT4E20H4XC 131L9874 30KW 61A FC-101P37KT4E20H4XC 131L9882 37KW 73A FC-101P45KT4E20H4XC 131L9890 45KW 90A FC-101P55KT4E20H4XC 131L9898 55KW 106A FC-101P75KT4E20H4XC 131L9906 75KW 147A FC-101P90KT4E20H4XC 131L9914 90KW 177A Brisynergy specializes in providing automation equipment products Mainly supply products: PLC : Mitsubishi, Omron, Panasonic, Siemens, Allen Bradley, Delta, Schneider Inverter : ABB, Siemens, Allen Bradley, Fuji, Mitsubishi, Yaskawa, Panasonic, Omron, Schneider,Delta Servo Motor : Panasonic, Yaskawa, Mitsubishi, Fuji, Siemens, Schneider, Delta HMI&Touch screen : Proface, Hakko, Panasonic, Mitsubishi, Siemens, Allen Bradley Sensor : Omron, Sick, Datalogic, IFM,Keyence Pneumatic : SMC, CKD Phoenix Contact Ms Dora (Sales Manager) Skype: brisynergy03 Warranty: 1.Manufacturer provide 1 year warranty if failure due to manufacturing problem. 2.It will be user responsibility if the failure is due to improper application and usage. 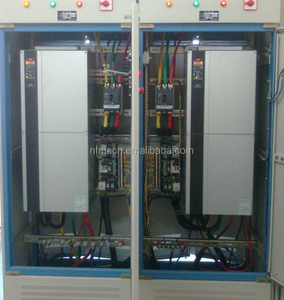 3.We will inspect and repair the project subject to repairing cost. All products we sell are original new. Q2. What is your terms of payment9 A: T/T 30% as deposit, and 70% before delivery. 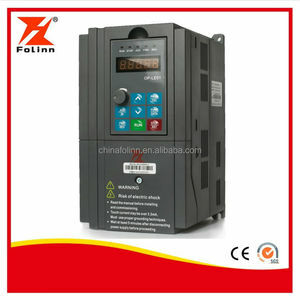 All time free to answer your question of the inverter. We will prepare the goods after your payment is received (Within 1-2days) . h. Carton packing or wodden cases with plastic inside. Our Main Products Our company has rich experience in automatic industry. 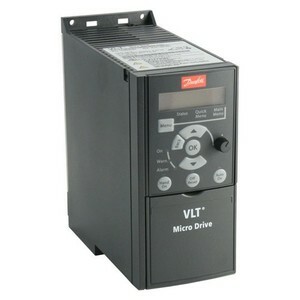 Alibaba.com offers 1,255 danfoss drives products. About 56% of these are hydraulic parts, 19% are inverters & converters, and 1% are other electrical equipment. 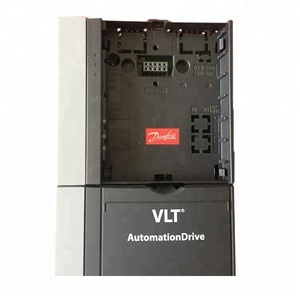 A wide variety of danfoss drives options are available to you, such as dc/ac inverters, dc/dc converters. 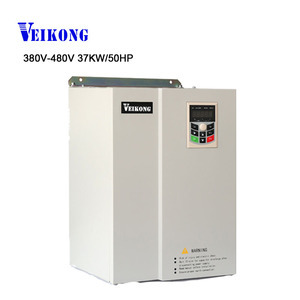 You can also choose from 1 - 200kw, 201 - 400kw, and >1000kw. As well as from single, multiple, and dual. 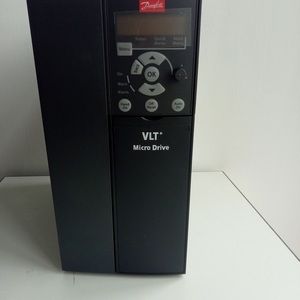 And whether danfoss drives is free samples. There are 1,243 danfoss drives suppliers, mainly located in Asia. The top supplying countries are China (Mainland), Singapore, and India, which supply 97%, 1%, and 1% of danfoss drives respectively. 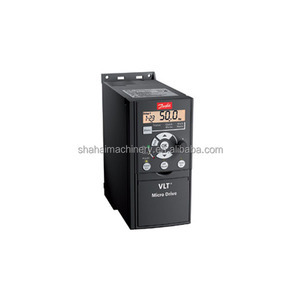 Danfoss drives products are most popular in Southeast Asia, Domestic Market, and South America. You can ensure product safety by selecting from certified suppliers, including 319 with ISO9001, 34 with ISO14001, and 13 with Other certification.